1. I enjoy accessorizing my dogs, as evidenced below from the AR vs. Auburn game this past weekend. Sorry for the awful quality! 3. 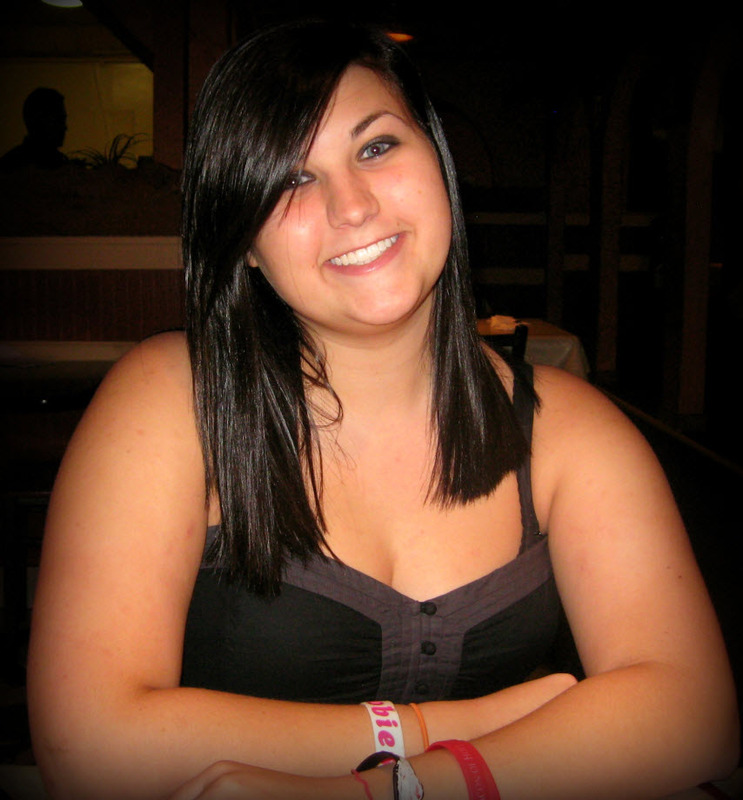 I pigged out with my youngest SIL (Stephanie) and Stephen last night at La Huerta, a local Mexican spot in The 'Ville. We took her shopping for her b-day and then we all ate to our hearts' content. I was actually sore this morning....no. lie. 4. I may or may not have purchased a gift for myself at Maude yesterday whilst shopping with Steph...oops. I looked around at our local target and everything just seemed really...I dunno...loud. I'm all about patterns in clothing, but yowza. Because I know lots of peeps are very, um, passionate about their Missoni, (and because I really don't wanna get hate mail), I will say that I've seen a few items on other people and they look really adorable. So adorable in fact, that it prompted me to get my rear to Target to look for some Missoni myself. But after trying on a few things, I came to the conclusion that I, Leslie, was not meant to wear Missoni. I felt like I was wearing a costume, all Joseph and the Amazing Technicolor Dream Coat and whatnot. So yeah, Missoni is a no go for this chica. And that, as they say, is that. 6. One of our security guards at work yesterday said he thought I was just out of college. (I'm on the verge of turning 27.) This made me quite happy. I guess it could mean one of two things: 1) He really did think I had just graduated college. 2) My maturity level leads one to believe that I'm a recent college grad. Still, I was pleased as punch. I can probably put off my Botox plans for a couple of years (joking), but no way in Hells Angels am I gonna quit using my Lancome Generist serum. No ma'am. Finally, not a confession, but I'd like to give a shout out to all the ladies of Pomfret Hall at the University of Arkansas! It's my understanding that a few Blonde Ambition readers reside there, including my youngest SIL Steph and her fabulous roomie Ryann (holla!!) Thanks for all your support, ladies! Oh my gosh, you're not the only one who can't get into the Missoni line. It's too much, especially with everyone wearing it everywhere! I'm not a Missoni person either. To each his own. While I don't root for the same team as you that dress is adorable. Good pick! Yes, I know the carlton (in fact, was just watching it this morning), and that is hilarious. Such an adorable dress btw, so its okay! haha. And I can't get into Missoni either. I saw a scarf or two that I thought was so cute (it was the real thing, on someone else, havent seen it in target) but I don't really think any of it is for me. I totally feel you on the Missoni clothing. I went crazy the day it came out, sent my sister to Target while I stalked stuff on eBay. Fun as it was, I opted for pretty mellow things - the black pumps with the neutral zig zag, a neutral brown zig zag tray, and the rain boots. I might have gone for a scarf if they had them, but that's about all I liked! And I haven't seen anyone wearing the clothes yet! I'm anxious to see what they look like in real life! And please... tell me more about this Generist stuff! Lancome is where I get all my makeup and at 27 I'm figuring I should probably start some anti-aging skincare stuff. For starters, your dogs are adorable! that dress is to die for..and that, as they say, is that. 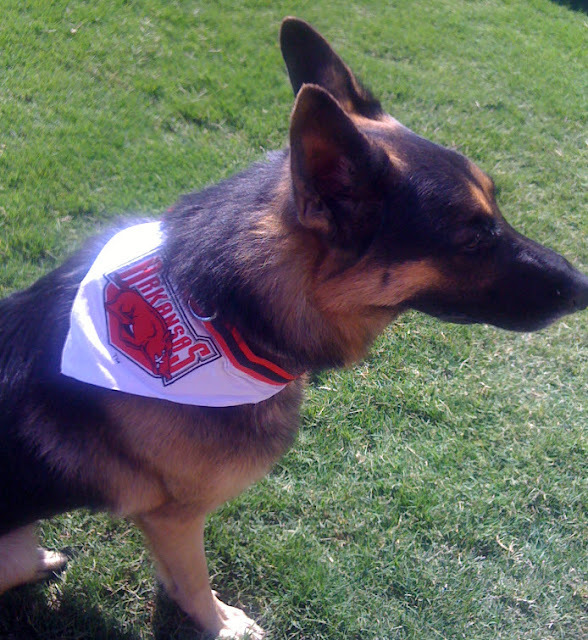 i love seeing cute dogs supporting the hogs! Yeah I can't get into the Missoni line either...not for me! Cute Dress! I don't get the Missoni line for Target either. I think it's hideous! :) We're not alone!! cute dress!! and i miss my momma, too... especially now, because im sick and my hubby is working out of town. and i totally agree about the missoni line for target, i do not like it AT ALL. LOVE the gameday dress! So cute! Very cute dress! And I can't get into the Missoni stuff at Target either...it reminds me of Austin Powers. This is not the 70's folks. I'd love to know if or when your doing the style consultations again! That dress is ADORABLE on you! I'm jealous. Also? Hate the Missoni line. Yuck! When the Missoni line first came out, I was super excited...and then I was very let down when I went to the store! Maybe one day they'll throw something out there that I can wear?? Oh my gosh, I'm totally NOT into the Missoni line either! Bleh. P.S. The dress, SO cute! 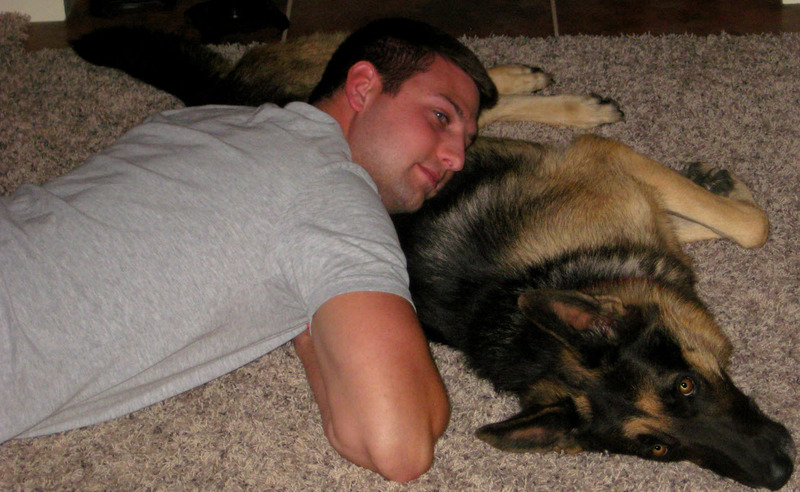 Aw, the pups are so cute!! I love how in love you are :) Makes me so happy for you both. And I too, can't understand the Missoni obsession. It definitely is NOT for me. I would like a clown. Bottom line on that one. I love all the pics... that dress is so cute on you and your SIL is gorgeous! 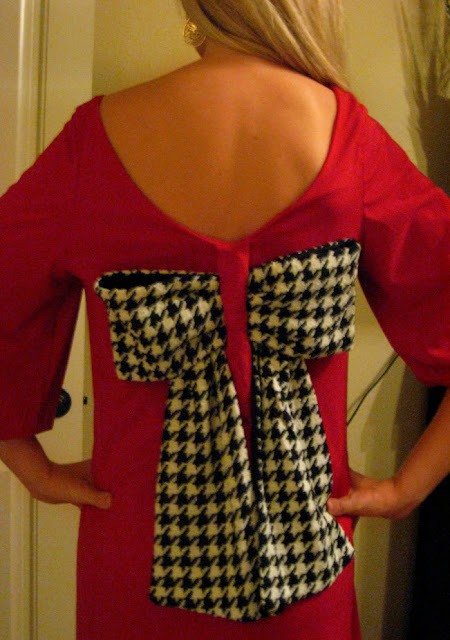 Love the hounds-tooth bow back dress! ps - the word verification thing says "sistic" ... did you custom make that?!?! Love to accessorize my dog too! He hates it, but it's just the most adorable thing to see him in some cute little outfit or bandana! I dont like that target lin either! idk i dont think people would be so into it if it wasnt "designer" and hold up girl you wore houndstooth to support arkansas ?? Yeah, I wasn't really sure how I felt about the Missoni line either. Was it so big that the Target site crashed for hours and hours? Meh. I don't feel like such a "fashion outcast" anymore because you're the third person in the last 10 minutes who has stated they don't like the Missoni line! And that dress is TO. DIE. FOR!! I'm an Alabama fan so that would be more than perfect for a game!! LOVE your dress! So cute!!! I love your gameday dress!!! Houndstooth and bows - does it get any better!! Love this post! That dress is just adorable! I am so happy you're enjoying your two boys in your life :) makes me want to find a man even sooner! hah. And I totally agree with the Missoni line. Ick, I can't even stand to look at it! And of course the security guard thought you were out of college- you are so young! Hope your Wednesday was great! I have been dying to purchase that dress! Currently shopping is not in my poor college girl budget but hopefully for my birthday coming up, mommy? haha You are precious, LOVE your posts! I love love love that dress. 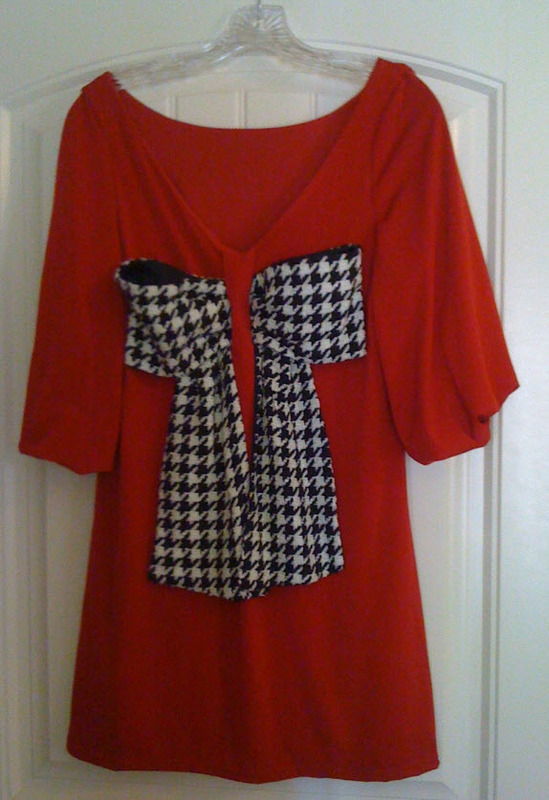 I'm a Bama girl so I love anything houndstooth. Happy Wednesday! You are not alone as a few stated above, The new Target line isn't for me either! Oh I adore judith march. So many of the dresses are really transitional from warmer weather to cooler weather. I have swooned over that big bow dress ever since they put it out. I ended up buying one that was more "gamecock." I do adore some houndstooth. One of my most recent post I showed where I used those fingernail decal things that were houndstooth. 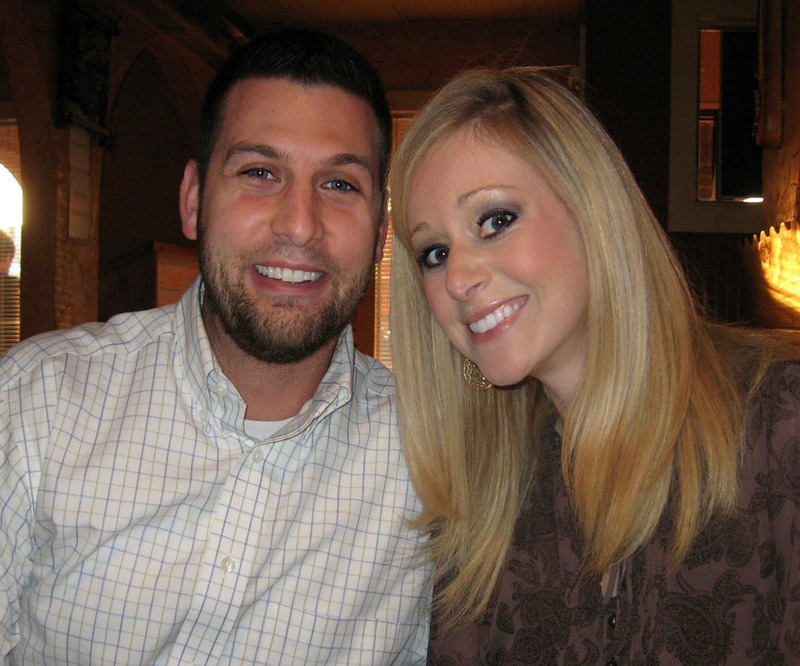 Your hubby and SIL look so much alike. You are hanging out with some good lookin' people. :-) Thanks for sharing! I love that dress you've got on!!! Love it!! 1. 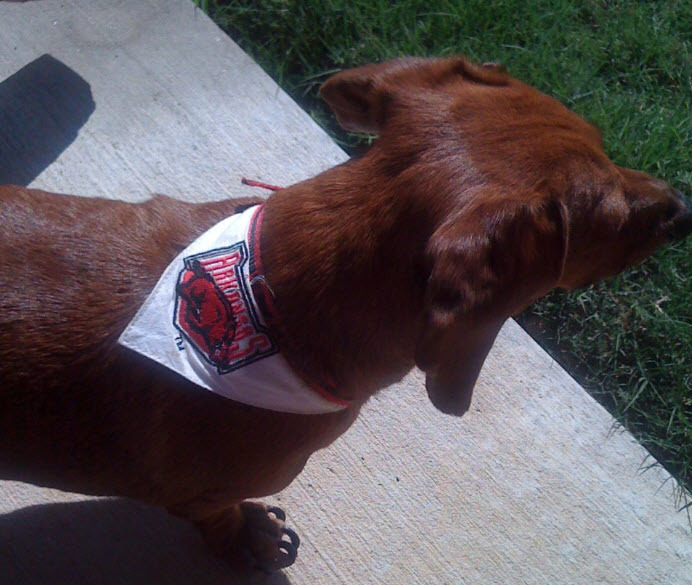 We dress our dog for game day too - she has a lovely houndstooth bandana for AL. 2. Speaking of houndstooth I wish I was your size and lived closer so we could swap game day gear ;) 3. Missoni for Target = hated it. [to the tune of In Living Color]. 4. Carlton is the man!